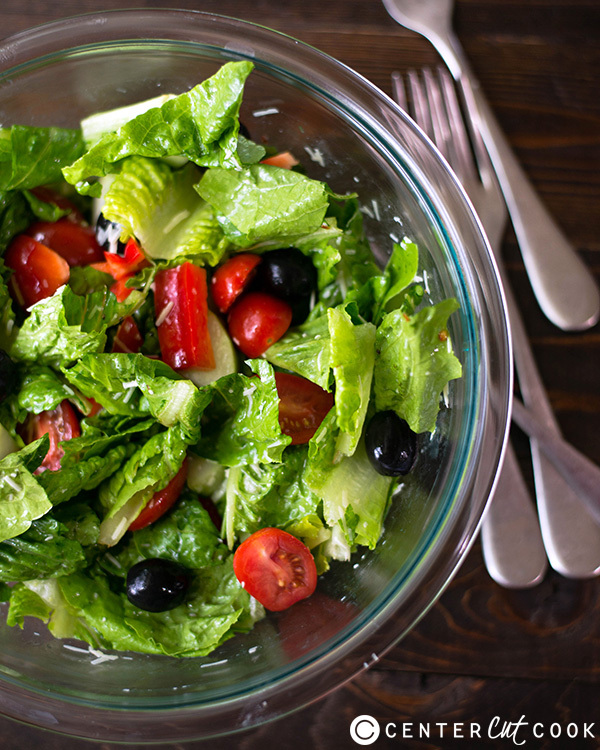 There’s nothing better than a big Italian Salad made with fresh, homemade Italian dressing and loaded with vegetables and Italian spices. There’s something so satisfying to me about a big bowl filled with a delicious salad that is made from all fresh ingredients. And, when you make your own homemade salad dressing, it’s even better. This salad is full of fresh and vibrant flavors and contrasting textures. There’s the acidic grape tomatoes, salty black olives, and crunchy bell peppers that mix so nicely with the soft, crumbled feta, and the savory Italian dressing. If you’re used to buying bottled salad dressings from the grocery store, I highly recommend trying to make a homemade dressing for yourself. The flavor and quality is so much better than the bottled stuff and it’s really not difficult to make. Plus, you save yourself all the unnecessary preservatives, fats, and other additives that bottled dressings contain. While this salad is great on its own, you could easily top it with grilled chicken if you’d like. I also like having it as a side to other Italian-themed entrees, like spaghetti or chicken parmesan. It can easily be the star or the supporting role. Make sure to refrigerate the homemade dressing after use, as it will keep for about a week in an air-tight container in the fridge. I pour my left-over dressing into a mason jar and seal it. Then, when I’m ready to use it again, I just shake it up in the mason jar and it’s ready to go. To make the dressing, combine the vegetable oil, olive oil, apple cider vinegar, red wine vinegar, garlic, parmesan, sugar, kosher salt, pepper, oregano, red pepper flakes, and granulate onion in a medium mixing bowl and whisk vigorously to combine. Set aside. 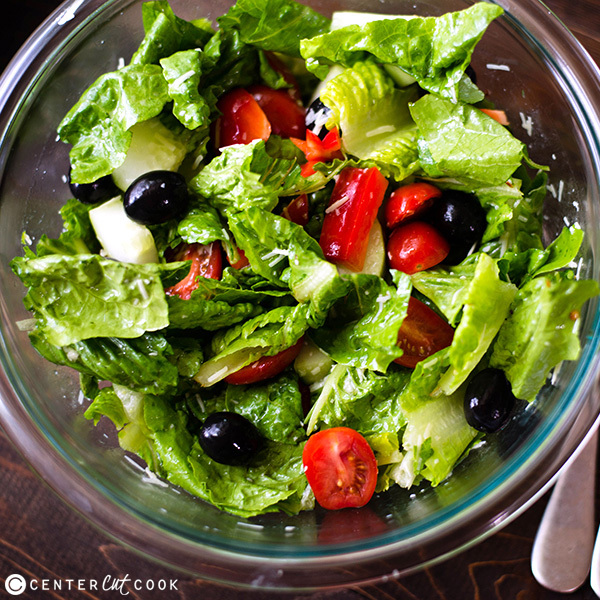 Combine the lettuce, tomatoes, olives, bell pepper, feta, and cucumber in a large mixing bowl. Drizzle 2-3 tbsp. 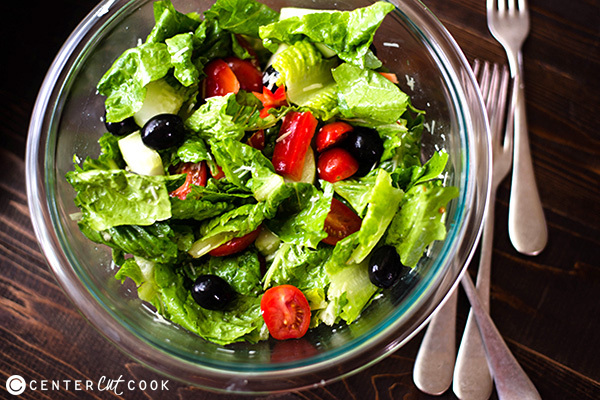 of the Italian salad dressing over the salad and toss well to evenly coat al the salad. Leftover dressing can be stored in an air-tight container for up to a week in the refrigerator.